So after having a few, ahem, incidents, I'd like to propose a formal set of etiquette or code to govern the expectations around social behavior at parks and playgrounds for kids (particularly toddlers) and their caregivers (SAHMS and the like -- my new personal moniker: Stay At Ho-Mo). I have developed my own set of park-rules, based on several assumptions. Until recently, they seemed to work. However, I have come to realize that my assumptions may, in fact, not be universal. 1. If you are at the park and caring for a child of a given age, the child either a) is a toddler, b) will be a toddler or c) was a toddler. The age can be challenging and we need to all understand and respect that, giving both the toddler, him or herself, and the caregiver wide berth. 2. If you are at the park, it is your intention to be social. It is a public place, after all. If you wanted to be alone or with some preferred group of friends (kid and otherwise) you should have stayed home. 3. That one (possibly latent) goal of going to the park is to socialize your child. This may include the following activities: making friends (for him and yourself), introducing the notion of sharing, and gently disciplining unacceptable behavior like stealing, kicking, throwing sand and the like. 4. That at the park, however prepared you may be, your child will inevitably strictly-prefer whatever food, toy, hat, shoe style and other apparel that some other kid has over his/her own. Knowing this, I usually try my best (bringing along various trucks, balls and snacks) but am open to sharing anything and everything with any kid that comes my way. 5. That some toys will be left behind and some toys will be found (without a current owner) suggesting an organic "toy turnover" in the neighborhood. Apparently these broad assumptions are not shared by all. Today at a local beach we unfortunately missed the GLBT family play-date that was scheduled and so we set out to make-due without our sturdy companions. Big walked right up to a group of young girls (say threeish) who were in the process of constructing a somewhat intricate sand-city complete with what appeared to be a down-town area constructed from an empty cottage cheese container, and another park-like area consisting mainly of small would-be boulders (to the inhabitants of such a city). Big, fascinated by them and their work, set out to "participate" (i.e. demolish). I, being the ever-willing urban planner that I am, sat down with him and one of the now-somewhat-dissapointed-looking girls (the other two had moved on to other pursuits) ready and willing to rebuild as needed. I looked over my shoulder to find, presumably, one of the girls' mom giving me that passive-aggressive concerned look that I literally could not interpret. Here I was, engaging with the kids (not sitting on the bench) and it was, after all, SAND!!! They are all big sisters. . . I guess they'll understand, said she. I began to rebuild in ernest. Oh, you don't have to do that, said she. Keep it up!, meant she. In another recent incident, Big and I ran across a boy with a literal HEAP of matchbox cars. Big was fascinated and sat down with him and started playing. The boy turned to his mom, nearly weeping, and she looked at me as if to say "why did you let your son play with my son???" The last installment at this time is a story of which I am not proud, but lends itself to the establishment of my proposed social code. We were at a pool with some friends. It was time to go and, as is the case whenever kids have been swimming in the sun for several hours, a meltdown was imminent. They were hungry and tired, and we had to get out of the pool area, into the car, and home before those needs could really be met. Oh, and they didn't want to leave the pool. Big had spotted a little matchbox truck, alone on a foldout chair. I grabbed it, knowing that it would distract him while I got him into the stroller and, hopefully, out of the pool grounds. As we were leaving, we stopped to say goodbye to our friends. One friend's son (a bit older than big, possibly nearing four) recognized his truck. I turned to his mom and although in my head I was screaming "please don't make us give it back! please don't make us give it back", I said "oh! Is this yours?" She recognized the toddler-predicament in which I stood and let is borrow the car for the time being. What is your toddler/park code and what assumptions do you make about this unique social situation and its associated decorum? I have no toddler park etiquette since I've never had a toddler...skipped that age completely. But, Stay at Ho-Mo. Love it. Hilarious. Still laughing actually. SHOOT! I thought I had covered it all. Sorry, HW. In any case, you get my drift. 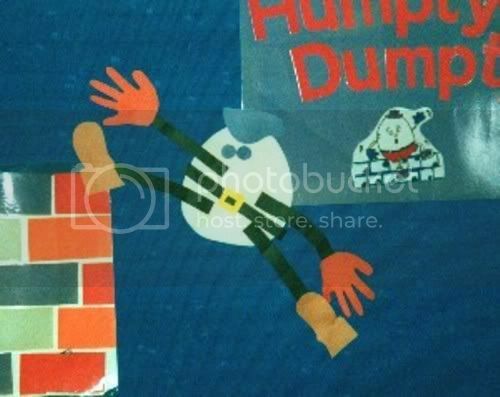 Love Humpty Dumpty by the way! Love the Stay At Homo. Which is how I'm thinking of it in my head. And I totally concur with all your toddler ettiquete notes. If our kids crossed each others' paths at the local park, we couldn't guarantee an absence of conflict, but I know we'd roll with the waves in a similar way.